The San Diego Association of Governments (SANDAG) commissioned a study of two transit modes along the 2.7-mile Pacific Beach corridor. This corridor connects the Mid-Coast LRT line now under construction to the Pacific Ocean and serves neighborhoods in the Pacific Beach community. One mode studied is a light rail line in the median of a city arterial. The other is a skyway consisting of overhead cable-operated gondolas. 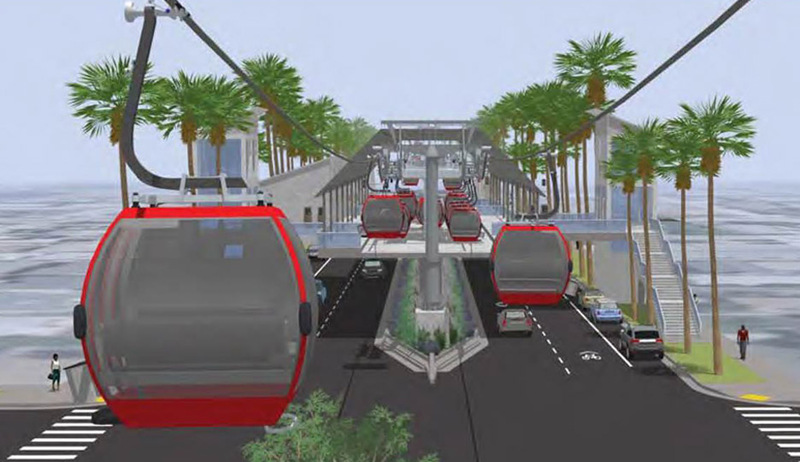 Although light rail transit has been a feature of the San Diego transit scene since 1981, skyway would be a new mode for the area. Known primarily in recreational areas, skyways are now being introduced to urban areas in various parts of the world as a potentially less expensive and less disruptive means of mass transportation. CHS Consulting Group managed the study and oversaw all work. CHS was involved in selection of the alignment and station locations, station design, and operating parameters. CHS supervised environmental and geotechnical assessments, creation of conceptual plans, and estimation of capital and operating costs.